ABOVE: The re-enactment. BELOW: Bloodwood (from left) Bloodwood, from left, Ross Muir, Barry Skipsey, Scott Balfour, Bob Barford and Dave Evans. They may be a little older and greyer but their voices and musicality are undiminshed. The return of Alice’s much loved folk quartet Bloodwood was a highlight of last Sunday’s occasion which had brought them together on stage for the first time in years – the celebration of the 1860 epic journey of John McDouall Stuart into the Centre. Together with companions William Kekwick and Bejamin Head, Stuart was the first white man to reach this part of the country. Sunday’s was a joyful event. Heavy rain had caused it to be moved from Owen Springs to Simpson’s Gap but if anything, the majestic qualities of the red sandstone ranges rising either side of the gap against the sombre sky only added a fitting impressiveness. As Kekwick descendant Rick Moore said, the excitement of the Stuart story is “all about country”. This was also what Bloodwood’s Dave Evans wanted to convey in the song he and Barry Skipsey composed for the occasion. His sense of Stuart, of what made him tick, was that he “was at home in the bush”. In the song, “What drives a man?”, this translated into a chorus line – “The unknown was the only known comfort John McDouall Stuart desired”. Stuart was the spearhead for non-Aboriginal people to develop relationships with the bush in the Centre, for it to become less unknown and for many, cherished. 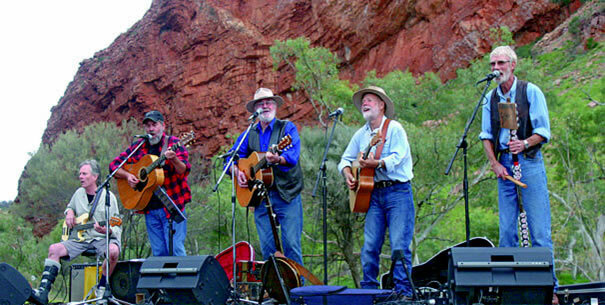 Love of the land, of ways of living on it is what many of Bloodwood’s songs are about and listening to them, variously funny and moving, as the sky pressed down and kites wheeled above the cliffs softened by a mist of green grasses, was a memorable experience. The centrepiece for the day was a reenactment of Stuart’s arrival in the Centre. 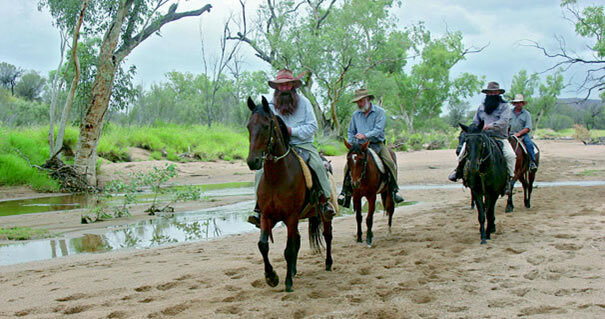 In the role of the explorer was fourth generation Centralian and pastoralist, Billy Hayes. “What a remarkable man he must have been,” he said. Mr Moore, who is president of the John McDouall Stuart Society, makes the point though that Stuart was not without his faults. In his failure to provide adequately for the nutritional needs of the expedition, Stuart showed that he was ready to let himself and others die. The knowledge of what was required was available, says Mr Moore, but Stuart chose to ignore it. Why he did so “remains a complete mystery to me”, he says. Benjamin Head certainly paid the price, as event organiser Stuart Traynor pointed out on Sunday: the 18 year old lost half his body weight on the 1860 expedition and never fully recovered his health. But, says Mr Moore, Stuart also paid the price: he died in 1866 at age 50, only four years after he returned from his last expedition, while Head lived on for another 40 years. Mr Moore is sure that Stuart’s “severely compromised nutrition over many years” contributed to his early death. Mr Moore clearly has a passion for the Stuart story. It was awakened initially by his ancestry but kept alive by “the country”, he says. He has made his living in the livestock industry, knows how to cook on a campfire and get from A to B using a GPS (and “probably a compass”, he admits), but when you get a sense of the country that Stuart traversed and begin to appreciate his toughness and resourcefulness, “it all changes”, he says. It was an all-male cast on Sunday and they were the achievements of men that were celebrated, but one man made sure he remembered the often unacknowledged role of women in the bush. Ted Egan, singer-songwriter, historian and former Administrator of the Northern Territory, had his own song about Stuart, “Rider in the mirage”, honouring him as “intrepid man number one”, but he closed his set with the recital of a poem, “The Bushwoman”, inspired by a station woman he once met, a woman with her own kind of fierce courage and determination. Mr Egan alluded to the problems Alice Springsfaces to day but imparted a sense of optimism about the way forward. And if on Sunday we were remembering the start of something, of the venture that paved the way for most of those present to be in this country, there was also a strong sense of vitality, blessed it seemed by the scattered drops of rain that began to fall as Bloodwood sang their last song. ADMIN LOGIN || Photography - Barry Skipsey || Web Site jointly designed by Netgrrl SG & RedDirt Graphics.